The Tampa Bay Rays promotes and supports reading programs, games and activities for the kids with many Libraries. I was invited to do a Question and Answer period, read my book Danny the Dragon and do an activity time to a group of 97. Heaven! Is this Heaven? Oh, it’s just home! Why is it that many of us long to travel, we then go there and then we get home to Florida we never want to head out again for quite some time. I LOVE my home, my schedule and of course my studio. I really live in my studio and seem to enter my home for food, sleep and of course a hug to my husband. Anyway, I am back and lots happening as you can read and view on the Internet about Danny the Dragon, Tina Turbin as well as my Gluten Free site www.glutenfreehelp.info . Exciting stuff. Happy to be back with our daughter, Miranda. It is hot as “#%$” in Florida! The CD is really moving now and I have got some wonderful news to share , so check back! Yellowstone, wow! I have to admit this is a place everyone NEEDS to visit. It is huge and I could have stayed much longer but we need to get back home and on the way to the Dakotas. Mt. Rushmore here we come. Danny the Dragon is by my side and in my thoughts and lots is being written on the computer and in my notes, While I am traveling I am in touch with many people about more adventures of Danny. The compilation Danny the Dragon CD is underway and now we are working on hiring that lucky lady for the VOICE OVER. Many say I should do it since I read so often to all these kids and am animated. Well, I do not know about this idea. Whatcha think? I can honestly say I love the weather in Florida. I want to go home! Some say I am crazy but I will take sweating and humidity over the cold winds of the Puget Sound and the North East any day. I guess this is why I moved to the South East to do my writing. Did I say I am really bi-coastal? You will see I am on the West Coast frequently, yet do prefer the clean air of Florida and sitting out in my studio overlooking the little lake, big oak tress (yep Florida oak trees) and all the space writing away on my computer daily, taking breaks to try out another recipe, occasional attempts at learning Photoshop and the use of my digital camera. I am happy to be heading back soon, but first to Yellowstone and the Dakotas. I haven’t shared with you a number of schools I was doing readings and Question and Answer periods with. 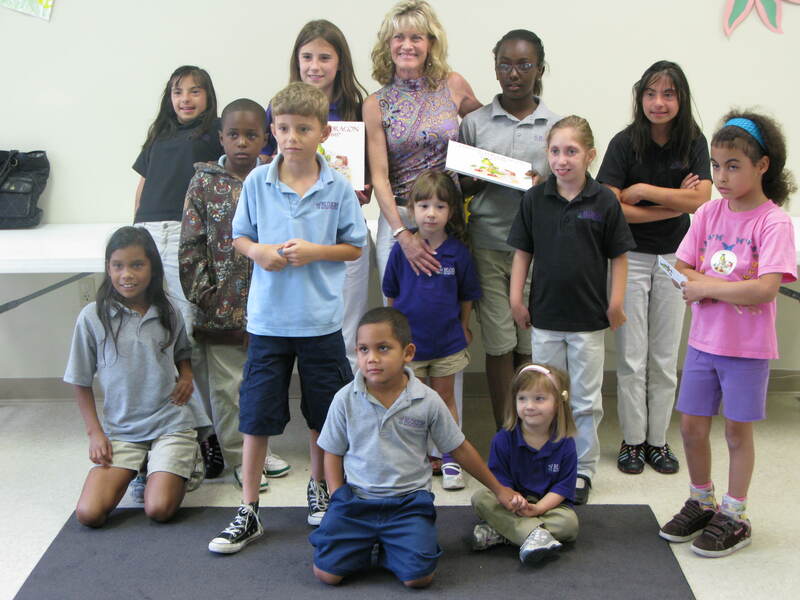 One school I need to pay my respects to is a Florida Montessori School for the deaf I visited before I left on my trip. I was honored to do a reading at their school while one of the teachers did sign language. I am leaving Los Angeles and heading up North to Alaska and Vancouver area. What a great time in LA writing and spending time with these two men and their girlfriends www.turbinbrothers.com. They are so darn talented and with the Arts as part of their ever waking moment, it is only contagious. We truly love being around one another. They love all I am doing as an author and I was happy to share Danny the Dragon with many others while in Los Angeles. I love being a mom!